When you’re at a Game Con, it’s important to make sure you eat in order to keep your energy up. You don’t want to skip meals…even though it’s tempting with all those games to play! If you want a little snack, with a little sweet…this White Chocolate Snack Mix will surely hit the spot! Put it in plastic bags in your convention bag and you’ll have snacks to keep you going all day and night! Let us know if you make this tasty snack mix! In a large bowl, combine the Cheerios, Corn Chex, Salted Peanuts, M&M's and Mini Pretzels. Set aside. In a microwave-safe bowl, heat 2 packages (12 ounces each) of White Chocolate Baking Chips and Canola Oil at 70% Power for one minute, stirring once. Microwave on High for 5 seconds, or until smooth. 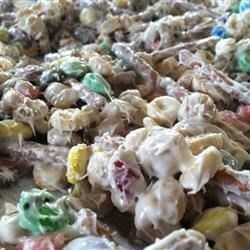 Pour melted white chocolate over cereal mixture. Mix well. Spread onto 3 wax paper-lined baking sheets. Let Cool. Break apart. Store in airtight container. We came up with around a dozen puns for the name of this episode (including a great Han Solo joke) but whatever we call it, we're talking about solo games. We've not played many solo games before this episode so it was an interesting experiment.